An Anglican priest who lost both his hands and his right eye over his opposition to apartheid in South Africa has offered his support to the community affected by the Corrib gas project in north Co Mayo. A jury has found two anti-Shell protesters not guilty of violent-disorder charges after a nine-day trial in Castlebar Circuit Criminal Court. Gerry Bourke (50) of Aughoose, Pollathomas, and Liam Heffernan (30) of Kilnagear, Belcarra, Castlebar, were both charged with violent disorder following a protest at a Shell compound at Aughoose, Pollathomas, on June 23, 2013. The two men pleaded not guilty to the offences, and following a trial before Judge Petria McDonnell, the jury of eight women and two men took less than two hours to unanimously find them both not guilty. 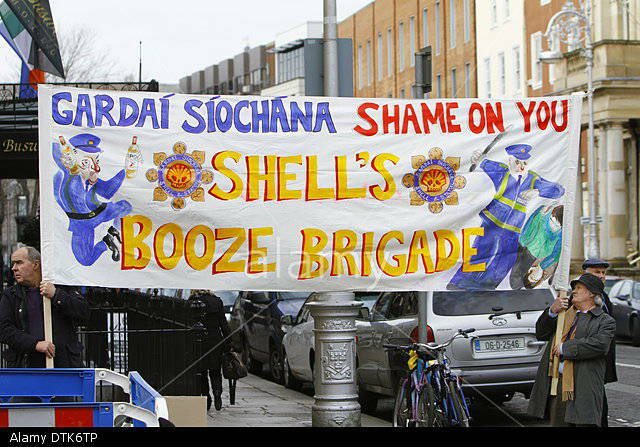 Shell has been accused of supplying £25,000 in alcohol to Irish police officers by two suppliers to an Irish gas project. Desmond Kane and Neil Rooney both claimed in court that they were told by someone from Shell E&P Ireland to buy the alcohol, according to the Irish Journal. Rooney told Castlebar Circuit Criminal Court that he was asked by senior pipeline engineer Conor Byrne to make the delivery in 2007. Two former suppliers to the Corrib gas project told a jury they supplied UK£25,000-worth of alcohol to gardaí in 2007 on behalf of Shell E&P Ireland. The allegations were made by Desmond Kane and Neil Rooney, co-owners of OSSL, which had previously supplied personal protective equipment for the Corrib gas project in north Mayo. Both claimed that a person from Shell E&P Ireland asked them to buy alcohol in Northern Ireland and store it in a container at the back of their premises in Bangor Erris. Two protesters have been found not guilty of violent disorder during a protest at a Shell compound in north Mayo. Two protesters have been cleared of criminal damage resulting from a protest at a Shell compound in north Mayo but still face charges of violent disorder. On Friday four Shell security guards gave evidence to the court and were cross examined by the defence.